Learn to manage and maintain your lawn the right way from the start. Purchasing your first home is an exciting time! But, it can also be a time of stress and uncertainty. If you’ve never taken care of a lawn or landscape before, be sure to ask a few specific questions about the landscape you’ll inherit with your new home. Are there pre-existing problems with the lawn, poorly placed shade or hazard trees, drainage issues, or a dated irrigation system? 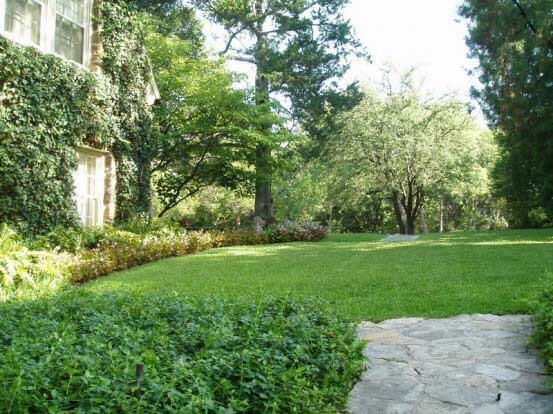 All of these issues can be both costly down the road and result in a lackluster lawn. If you dream of a lush lawn at your new home then there are key factors you’ll want to consider before you buy. Once you’re in your new home, you’ll want to follow these top tips to grow a beautiful lawn. We cannot stress this enough…you will not have a lush, thick lawn without first building soil health. Soil is a living organism and when it is healthy it will teem with microbes, earthworms, beneficial nematodes and organic matter; each plays a role in keeping your lawn strong and lush. With good soil maintenance, grass grows thick and strong, which reduces weeds, pests and diseases naturally. What kind of grass is growing? The variety of grass you grow will help you better understand its needs. How much water does it require? Is it drought tolerant? Will it tolerate heavy foot traffic? How short can you mow it? Common grasses in our area include Bermudagrass, St. Augustine, Zoysia and Buffalo grass. Lawn grasses are a sun plant and will require six to eight hours of direct sun daily to grow strong roots and thick top green growth. Grasses such as St. Augustine or Zoysia will will tolerate a little less sun, but even then they won’t look as healthy if they receive too much shade. How your shade tree affects your lawn HERE. Soil Testing: Starting out by having your soil tested will help you know exactly what your soil does, or doesn’t need, and how you’ll need to fertilize your lawn. Soil Aeration: Our heavy clay soils are often compacted. Your soil could be in need of aeration if the existing lawn looks weak, or the soil dries out too quickly, water sits on top of the soil a long time, the area is heavily used by kids and pets, the grass is freshly sodded or your home is newly built. Yearly core aeration improves compaction which improves water retention and drainage. Remedy the effects of soil compaction. Mow the Right Way: How and when you mow is important to your lawn’s overall health. The height you mow your lawn depends on the variety of grass you’re growing. Mow too short and your lawn could scorch. More on proper mowing, the right height and when to start mowing in spring HERE. Weed Control: Improving soil health is the start to reducing weeds. Healthy, vigorous lawns will eventually crowd out weeds naturally. Some weeds in your organic lawn are just a fact of life. Mowing in early spring is essential to reducing weed spread in your lawn. The key is to mow off the flower heads before they go to seed, but not mowing off more than ⅓ of the grass blades in a single mowing. Mowing techniques for weed control. Water Smart: A good rule of thumb to watering established lawns is to apply the equivalent of one-inch of rainfall per week, unless it’s raining. It’s important to know that infrequent but deep waterings are much better for your lawn health than frequent short waterings. Watering in short increments through the week only encourages shallow root systems, resulting in weakened turf that will encourage pests and disease to move in. More on proper watering HERE. Sometimes there is a point when a lawn may be beyond repair. Choosing to re-sod the lawn with a better species of grass, or replace the lawn with gardens or hardscape can be considered with input from a landscape professional. However, if your lawn just needs some TLC to reach it’s full potential, then using our Organic Soil Building program is a great choice.